You may know that Betty Lou’s Downtown Emporium is a Bellingham shop specializing in fair trade clothing, jewelry and gift items. But did you know it’s also a great place to get inspiration for decorating with salvage materials? Betty Lou’s owner, Betty Theiler, has been hard at work letting her creative juices flow as she built new display fixtures from recycled materials, chairs and doors (lots of doors) found at The RE Store. 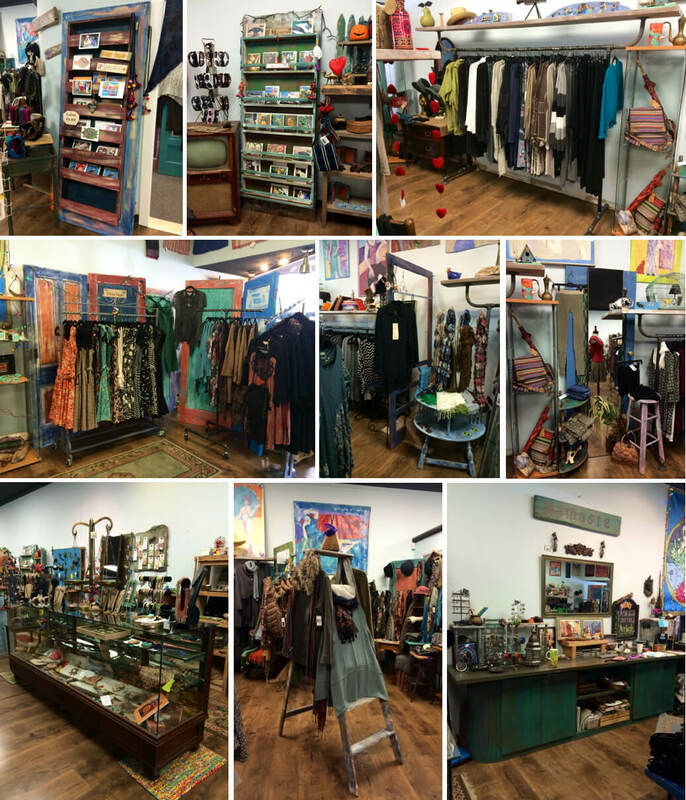 Examples of her salvage decoration style in this photo collage include: greeting card displays made with a recycled door as the back, and scrap salvage wood for the racks; clothing racks made with old pipes and recycled wood; repainted doors scattered throughout the store used as backdrops; screen doors with the screens taken out to hang merchandise on them; a door with a mirror attached to it; an upcycled glass jewelry case; a repainted ladder used to display clothes; and staff favorite – a long shelf behind the cash register made from a few shelving units and doors combined to make a countertop space to organize all the little trinkets, tags, pricing material, pens, pencils, and paper that the staff needs to work the floor each day. All of these displays have been repainted by Betty Theiler, and a few were built with the help of her husband. Check out Betty Lou’s Downtown Emporium – for your own salvage decorating inspiration, as well as for some great fair trade clothing, jewelry and gifts. Info can be found on their Facebook page here.